They say you either love it or hate it. I love it. And, thinking back, I love the way a jar of Marmite entered my story. A jar of Marmite can make all the difference in life! I love its quirkiness: the sunshine yellow plastic top and the bulbous and tactile brown glass jar. And it was this giant-sized jar of humble, brown gooey yeast extract in its iconic glass jar that accompanied me to India, that would later become the hook for an article in a glossy magazine and a 400-word article in the Financial Times. 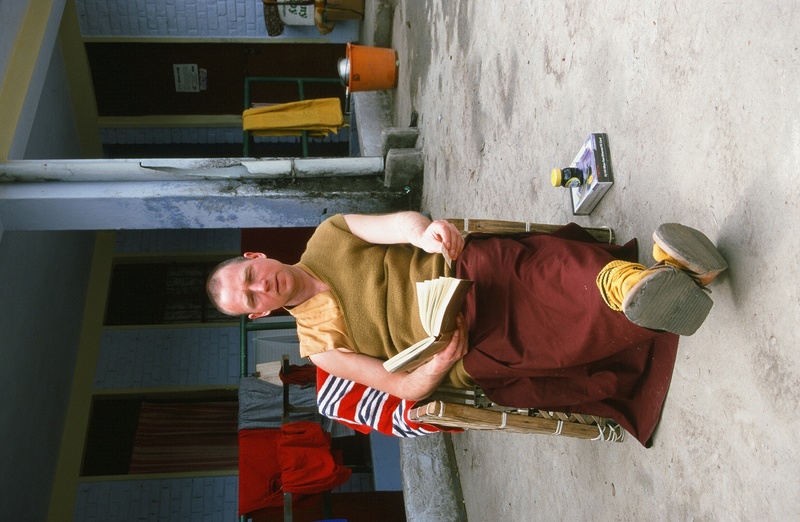 When Tenzin Josh’s mother asked if I’d pop a jar in my rucksack for him, I had no idea then what a pivotal role it would play in my writing career! It was a funny thing to take halfway round the world, I thought, but as his mother said, “It’s something for Josh to look forward to after a heavy morning of chanting and meditating…if he’s running low he emails asking for someone to bring over a jar” which is what I did. But there was more to that jar in my hand luggage as I stepped on to the BA flight to Moscow that day in April 2001, then on to Delhi on a glorious Aeroflot flight! I picked up a UK broadsheet on entering the plane at Heathrow, seated myself and glanced down at the page I’d randomly opened. Another Marmite mention. That day’s cartoon by Martin Rowson, staring me in the face, was highlighting the re-opening of the Georges V restaurant in Paris. King George V of England, done up in his ermine stoll, demanding from the waiter, “Bring me a Marmite sandwich”. 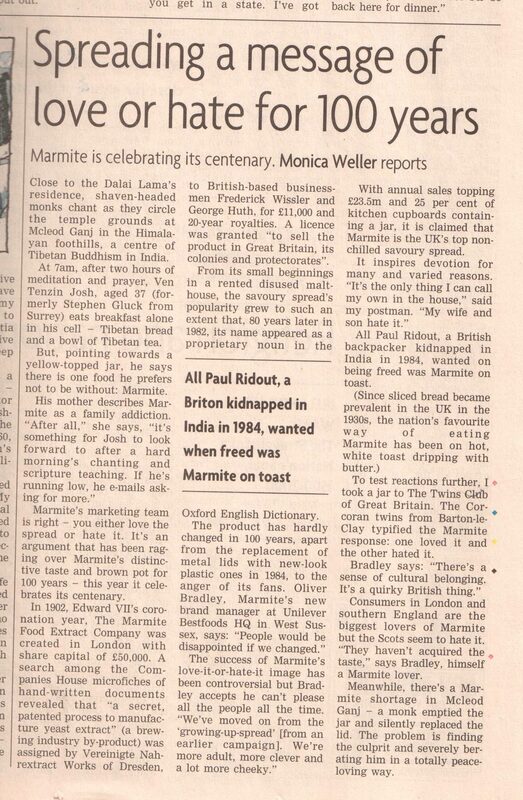 a couple of months later…and with more research….my Marmite story was published in the Financial Times.